Holiday sale coming to a close; Last chances for great savings! 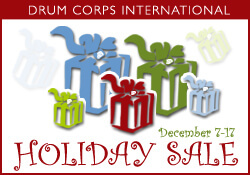 Don't miss this opportunity to buy the perfect gift for that special drum corps someone in your life! SHIPPING ALERT! Drum Corps International ships domestic packages via UPS. Holiday orders for delivery by Friday, Dec. 22 must be placed by Wednesday, Dec. 20, noon CT for second-day air service, and Thursday, Dec. 21, noon CT via next day air service. Check out all sales currently available through store.DCI.org. Sale ends Sunday, Dec. 17, at 12 a.m. Central time. Offers cannot be combined with other promotions or discounts. Offers not valid on prior purchases. Order confirmations DO NOT reflect discount pricing, but will be applied upon order processing within 48 hours. Drum Corps International reserves the right to modify or cancel promotion at any time.